Thank you for joining us this morning for the briefing on the persisting drought situation in some parts of KZN as well as the update on recent disaster incidents in the province. Today’s media briefing takes place against the backdrop of the devastating disaster incidents that have left a trail of destruction and scores of people homeless, especially in and around Ladysmith. We have just returned from Ladysmith which has, over the past weekend, seen some of the worst weather we have recorded in the province in recent months. A particularly devastating storm, accompanied by gale-force winds and localised flooding, struck a residential area outside Ladysmith on Saturday night and wreaked havoc in the local community. A total of 70 houses were completely destroyed, leaving some 400 residents destitute. KZN Cogta rushed to the scene to provide emergency relief to the community within hours of the storm. All affected families were provided with temporary accommodation. We have, to date, provided emergency support, including cooking equipment, such as stoves and cutlery, blankets, mattresses, food and temporary shelter, to all those in need. We have activated a Joint Operations Centre in the community. 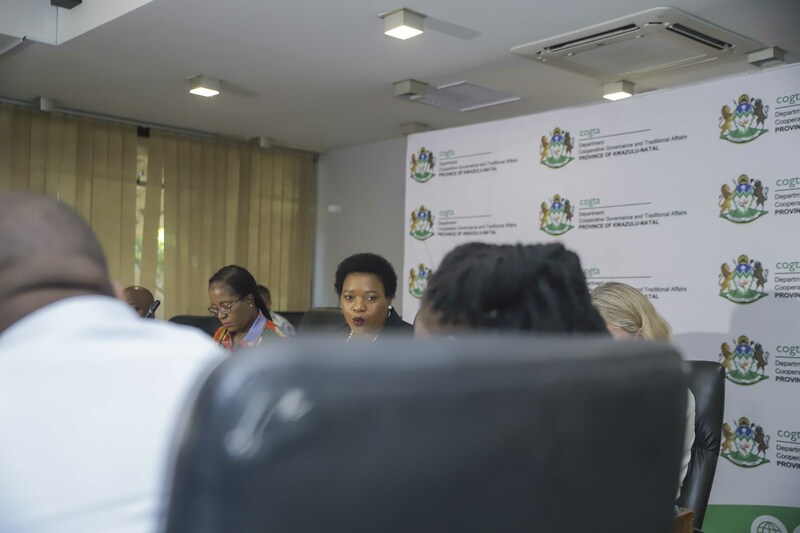 This centre is composed of all departments that are impacted by the recent freak storm incidents, including Cogta, Human Settlements, Social Development, SASSA, Home Affairs, Education, municipalities and NGOs. Our practical assistance will continue until we can ensure that the people can begin to rebuild their lives. Our efforts to quantify the damage in many other sporadic incidents across the province are still underway. Our conservative estimation at this stage is that this damage will exceed R10-million. The irony of it all is that even as we experience these freak storm incidents, some parts of the province remain in the grip of the drought that has persisted since 2015 and the situation has become worse, thereby affecting more areas and sectors on the ground. Interestingly, the uThukela district municipality where this incident occurred remains the epicentre of our drought challenges. The direct impact of the non-operation of the plant is that communities that were supplied with a minimum of 6Ml/day via pipe networks will have no access to water. Businesses in Ladysmith were also severely affected by the water supply which has resulted in businesses operating on a short time basis. This affects the economic growth of Ladysmith as well as employment. Abstraction challenges are being experienced at Bergville, Winterton, Moyeni/Zwelisha and Langkloof Water treatment Works. Similarly, Moyeni/Zwelisha Water Treatment Works normally experience challenges at the river abstraction point due to the low water level. Unfortunately, the drought conditions are not limited to uThukela district; indeed the adversely affected areas include King Cetshwayo and Zululand districts, and uMuziwabantu and Nongoma local municipalities, with concerns now also being raised in the Umgeni and Hazelmere systems. Similarly, the uMzinyathi district is back to water restrictions due to very little rain and low river and dam levels. For our part, we will continue to monitor the situation at this stage. Above average rainfall is projected over the next three months and this will, hopefully, improve the water resource situation so that restrictions are not needed across the province. The month of May is the hydrological decision month (the beginning of the dry period) and if the water system does not improve, we will make further announcements. If the drought persists, most of the areas will be severely affected as the borehole yield will not allow normal pumping schedule. Short-term drought intervention Business Plans amounting to R38-million have been submitted to Department of Water Affairs and Sanitation to source funding. Clearly, the drought that has ravaged our province since 2015 has not let up in many areas. As a result, KZN remains in the grip of what is known as green drought. This phenomenon has first been described in Australia where it was defined as a period of limited rainfall causing new but insubstantial plant growth. In KZN, the rainfall that has occurred has not been of equal volume everywhere. At times, we have witnessed isolated storms with lots of rain so people assumed the drought is over but the water table is not being replenished. The truth is that ground and soil water are still low and levels in farm dams are still dropping. Even more perilously, other dams remain at critically low levels, most notably Albert Falls Dam at 34%, Pongolapoort Dam at 42% or Goedertrouw Dam at 45%. The total for all KZN dams stands at 55%. Experts have said it was difficult to pinpoint the cause of the green drought or if it was linked to another upcoming el niño or to climate change. Our farming sector, at both subsistence and commercial levels, has been impacted negatively by this situation, especially in the Midlands. There is already a warning of another brewing crisis as persistent dry conditions and hot weather are threatening crops and livestock across the province. The threat to household food security, especially in rural areas, is real. Many subsistence farmers are behind the planting season. It is also concerning that as little as 60% of available land was planted this season and those crops are being threatened by relentless heat. If we do not get the necessary rainfall in some of the most affected areas, some of the crops that have been planted will die. When this happens, our country will need to import some crops, such as yellow corn which, in turn, is likely to hike the prices of staple foods. The green drought continues to have a devastating impact on the farming sector and support for the industry is being actively sought by the farming community. As government, we are acutely aware of this request and keeping a close brief on all developments. We extremely concerned as we are currently moving into the winter months which is going to increase the severity of the drought should the rains delay further. The Department of Water and Sanitation, in line with their core function, is leading our intervention. This is essentially disaster funding and we at Cogta will ensure, as we have done with such funding before, that it is used to mitigate the negative impact of the green drought in all affected areas. As government, we have been at the forefront of public awareness campaigns highlighting the effects of the prolonged drought that has been with us since 2015. We have worked closely with municipalities to introduce water conservation measures where necessary. The current state of KZN water resources and the reality of green drought now mean that these efforts must continue. We would like to assure the public that we are working with municipalities, farmers and all other stakeholders to conserve water and ensure that the negative impact of this green drought on our communities is minimised as much as possible. We have advised mayors and councillors in the province to monitor the drought and ensure that we all act and respond to the situation. We appeal to everyone to continue to use water sparingly. Mandatory restrictions remain an option in some areas. The abnormal heat wave has increased evaporation rates significantly and this is one of the reasons for the fall in the storage capacity levels. As government, we are fully conscious of the responsibility we bear to mitigate the social and economic impact of this green drought on the people of this province, taking into account that water is a scarce resource in our country.